Used Poweram model 2020 for sale. This is the original POWERAM. The Model 2020 pioneered the concept of pushing steel rods under roadways and pulling back a utility service line. It can generate up to 98,000 lbs. of pushing force. 5 ft. long rods can be added and removed within the length of the Model 2020. It has also been used for pipe replacement by bursting or splitting the existing pipe and pulling in a new pipe of the same or larger size. Please call us at 715-537-9050 or click here to submit an email request for more information. We currently have a used model 2020 for sale. It is not as pretty as the new machine pictured above, but all the wear components have been replaced, and it is in perfect operating condition. A used accessory tote box is also available. Just like the 2020, it is not as pretty as the new box shown here, but it is not damaged, so it has many years of service life left. It holds up to 42 of the 1-3/4″ dia. 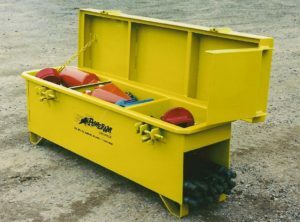 x 5 ft. long push rods plus push heads, couplings, and other tools in a very handy and very sturdy steel box.